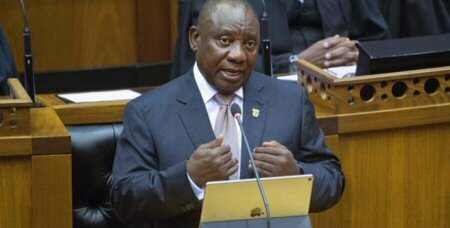 Speaking to the parliament in Cape Town, Ramaphosa said South African International Relations and Cooperation Minister Lindiwe Sisulu was working on implementing a decision by the ruling African National Congress (ANC) party to lower diplomatic ties with Israel. Ramaphosa stressed the South African government’s resolve to go ahead with the ANC’s decision. “The South African government remains seized with the modalities of downgrading the South African Embassy in Israel and we will communicate once the cabinet has fully finalized on this matter,” he said. “In implementing this conference resolution, we are mindful of South Africa’s responsibility to continue engaging with all parties to the conflict, to see where we would be able to provide assistance,” he added. The South African president further noted that the decision to downgrade the embassy in the occupied lands is driven by Israel’s violations of the rights of the Palestinians and the regime’ failure to enter negotiations on the so-called two-state solution to the Israeli-Palestinian conflict. PNN further reports that, last May, South Africa withdrew its ambassador to Tel Aviv in protest at Israel’s deadly crackdown on anti-occupation rallies in the Gaza Strip.